It has been described as perhaps the most curious regiment in the British Army, but the well-known names associated with the Artists Rifles were certainly not obscure. As the National Army Museum states: “It was formed in 1860 by a group of painters, architects, poets, sculptors, musicians and actors concerned about a possible French invasion. The Pre-Raphaelites were early members as were William Morris, Frederic Leighton and even the poet Algernon Swinburne. As did a less familiar name: Lance Sergeant Edmund Messervy, although he never entirely gave up his art during the conflict. Messervy’s part in the First World War has been highlighted by a lot sold at Cotswolds auction house Moore Allen & Innocent on June 29. 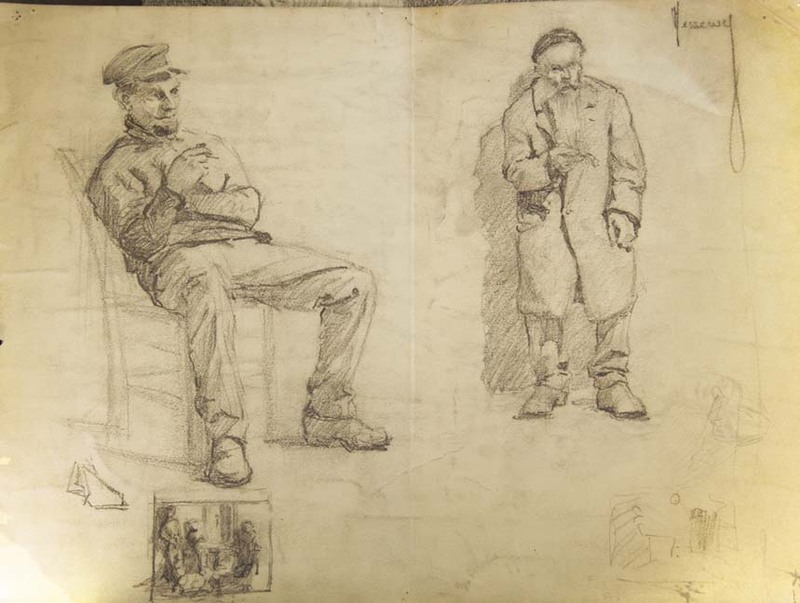 The lot contained a folder of sketches and watercolours he made during the war. These works, presumably made in France, included scenes and portraits of Breton fishermen and tradesmen, including a chef. 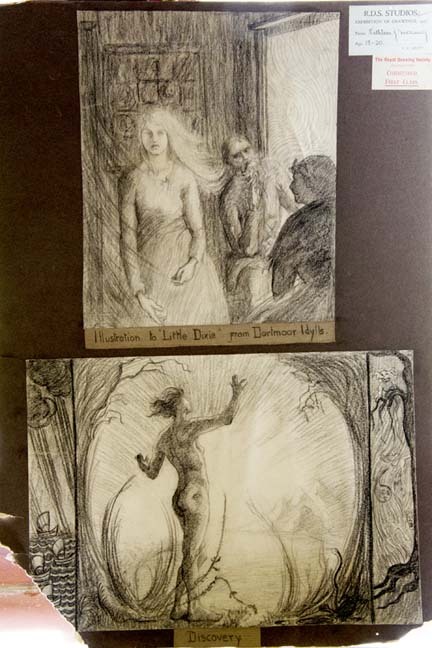 It also featured sketches and paintings by his wife Kathleen, whose Art Nouveau work was on display at The Royal Drawing School’s Exhibition of Paintings in 1927. 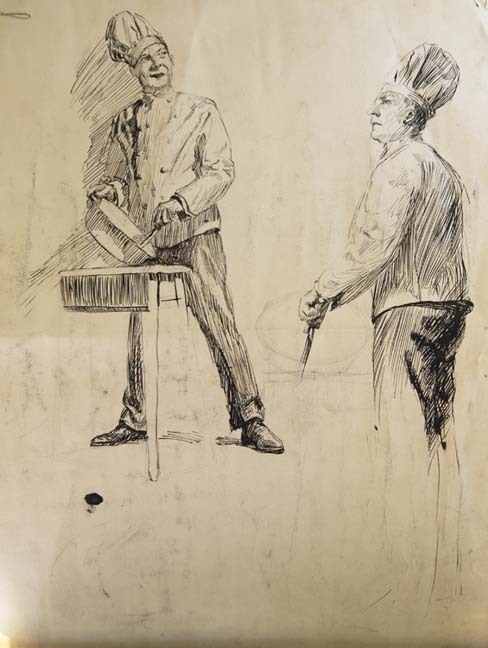 Drawings and watercolours by Edmund Messervy, who served with the Artists Rifles in the First World War, sold at Moore Allen & Innocent for £100. The lot also included work by his wife Kathleen - shown here. The price - £100, against an estimate of £50-80 – also demonstrates that while a Paul Nash will cost you many thousands, ‘more affordable’ options with Artists Rifles onnections are available by searching around the sales. The items were sold on behalf of the South Cotswolds branch of the RSPCA, to whom the pictures were donated. War records show that Edmund, who was born in Jersey and lived in Hornchurch in Essex, joined the Artists Rifles, which was at the time part of the London Regiment. He was killed during the three-month long Battle of Passchendaele on October 30, 1917 at the age of 32. His name is inscribed on the Tyne Cot Memorial at Ieper in Belgium, dedicated to the 35,000 British and New Zealand dead who have no known grave.